Holy Basil (known as tulsi in Ayurveda) is one of the primary botanicals used in India for reducing the negative effects of stress, by lowering cortisol production in the adrenals. Part of the diet powerful adaptogen, it helps to a normal blood sugar levels to hold, as well as promote focused. Skyrocketing stress is one of our nation’s most pervasive public health problems. Daily stress can cause imbalances in inflammatory COX-2 production and cortisol levels, which can influence blood sugar changes. 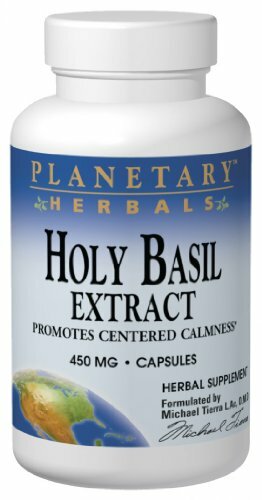 To regain balance, Planetary Herbals offers Holy Basil, a legendary Ayurvedic herb that is making news for its ability to inhibit the inflammatory COX-2 enzyme, balance cortisol levels and normalize blood sugar. Holy Basil is rich in beneficial compounds, such as rosmarinic acid, eugenol, and many other which work together to reduce stress. This herb also typically contains ursolic acid, which has been shown to inhibit COX-2 in in vitro research. As a result, Holy Basil has a positive effect on mental well-being, and can provide minor pain relief from everyday activities. Planetary Herbals brings you this special herb, used daily in India by millions, in a high potency, 450 mg capsule. Stress, Blood Sugar and Nervous System Protection For over five millennia, Tulsi (Holy Basil) has been used to improve digestion and restore imbalances of the body and mind. Now research has documented that Holy Basil may do this by decreasing levels of cortisol, a hormone produced and secreted by the adrenal glands. Nicknamed the “stress hormone,” cortisol production increases in response to chronic stress. Cortisol triggers the body to make glucose from amino acids, which causes blood sugar to rise.